Description: I noticeed the newest of the UP Evos have the "Building America" slogan and sheild on the sides. It is on the inverter cabinets on the other side. Description: Sitting on the main after backing up to recouple the train at Broadwater Road was UP Train KMNOA 29 with 2 GEVO's an a SD40-2 as the southbound passes on the siding. Title: UP 5253 "BUILDING AMERICA"
Description: A UP unit grain train sits at the Port Terminal Railroad Association. Description: Union Pacific special train with windmill nacelles and rotor heads passing the old water tank at Bliss, Idaho. Description: UP 5253 is seen heading up the westbound Z G2LT as it rumbles into town while tackling the grade. Description: Union Pacific C45ACCTE #5253 sits parked at the JR Davis Yard in Roseville. Description: Union Pacific C45ACCTE #5253 trails on a manifest as it rolls through Stockton. Description: UP 5253 Fernley flyer coming into Fernley from Hazen heading to Sparks. Description: Union Pacific C45ACCTE #5253 runs light through the JR Davis Yard in Roseville. Description: Union Pacific C45ACCTE #5253 trails on a manifest as it rolls through the JR Davis Yard in Roseville, CA. 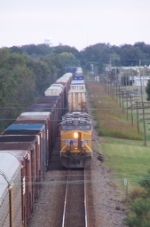 Description: A lone AC44CW leads a mixed train east and will soon exit the city of Mesquite and Dallas County.